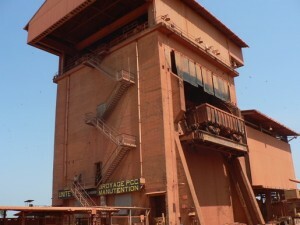 Founded in October 1963, the Guinea Bauxite Company (Compagnie des Bauxites de Guinée, CBG) is the largest bauxite producing company in Guinea and one of the largest in the world. It is 49% owned by the Guinean government and 51% owned by Halco Mining Inc, a consortium comprised of Alcoa, Rio Tinto-Alcan and Dadco Investments. CBG aims to explore and exploit the Sangarédi plateau in the Boké region. 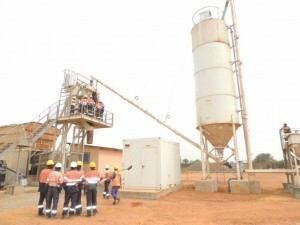 It currently operates open pit mines in Sangarédi, Bidikoum, Silidara and N’Dangara. Taking advantage of a 1999 agreement between the Government of the Republic of Guinea and Halco Mining Inc, CBG has grown from a joint company to a limited company, and has greatly transformed in terms of efficiency and good governance. In 1973, the first ship loaded with bauxite left the port of Kamsar with 19,000 tons of ore on board after a total time of 125 hours loading. CBG now has the capacity to load boats with 75,000 tons bauxite in less than 20 hours. 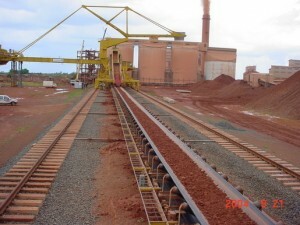 The historic company has seen a new surge in momentum, with its production reaching a record level of 15.24 million tons of bauxite exported in 2014. In order to meet the increase in global demand, CBG is currently implementing a project to expand its production and export capacity. This project will be implemented in two phases: a first phase with a production capacity of 18.5 million tons per year as of December 2017; followed by a second phase with an increased capacity of 22.5 million tons by 2022. To achieve this goal, the CBG will invest $1 billion in the expansion of the plant and port in Kamsar.